If you’re a homeowner who enjoys tackling household problems, chances are you’ve tried to take care of plumbing issues on your own. Plumbing repairs can range from quick adjustments to a huge overhaul of your entire piping system. It’s no surprise why that many people want to try to tackle the job themselves. Calling a plumber for every issue can get costly, and there are times when you could’ve fixed the problem yourself by the time a plumber is available for a visit. Whether you need to replace your washer or install a new toilet, you may end up running into obstacles based on the complexity of the work. Unless you’re a professional plumber, you may not have the expertise to overcome these hurdles. That’s why we’ve come up with a list of common DIY plumbing mistakes and how to avoid them altogether. Used to rotate plumbing pipes; can be adjusted to different pipe diameters by rotating the key ring. Used in small spaces to turn fasteners that would be tough or impossible to reach with other types of wrenches. An Inexpensive tool used for clearing sink and bathtub drains; not good for sending down flushable toilets because wire may damage the bowl. The first rule in plumbing is to always shut off the water supply before you start, and yet it’s so easy to forget this step. Trying to remove a fixture or repair a pipe before turning off the water can lead to massive leaks and a huge cleanup. The shut-off valve can often be found on the wall beneath the sink or whatever plumbing fixture you’re repairing. If you’re unable to locate the interior valve, it’s best to go outside and shut down the home’s entire water supply. The exterior valve can often be found at the side of your house or in the garage. If the shut-off valve has not been touched in a while, it may be difficult to turn. Use a plumber’s wrench to help loosen the handle. When the handle is perpendicular to the pipe, the water is off. Live in a place long enough and you’re bound to run into clogged drains. Drain cleaners are often advertised as an easy fix. Although there’s no harm in using a bit of cleaner for the occasional clog, it can be very harmful to your pipes if used frequently. This is because chemical drain cleaners are oxidizing. If you pour it down an old system, it can cause the pipes to erode and break down. In plastic pipes, these cleaners cause damage by creating heat. All that heat can melt the plastic and cause leaks. This long, stiff cable has a twisted end that can bore into clogs and unwanted material (like hair, gunk, and tampons) from your pipes. Consider renting a drain snake from your local home improvement center to take care of difficult clogs that can’t be fixed with a plunger. Salt, baking soda, and vinegar can be used to make a safe drain cleaner that won’t damage your pipes; look online for various recipes. It’s an innocent mistake that DIY plumbers often make: Joining together galvanized steel and copper pipes. If the pieces fit, you may wonder what the problem is. But pipes of different materials must always be joined with a special fitting called a ‘dielectric union’. Although you may not notice any issues right away, the mismatched pipes will eventually leak. Just because the pipes fit tightly, doesn’t mean they’re secure enough to hold water. Avoid this problem altogether by using a fitting or not mismatching pipes of different materials. 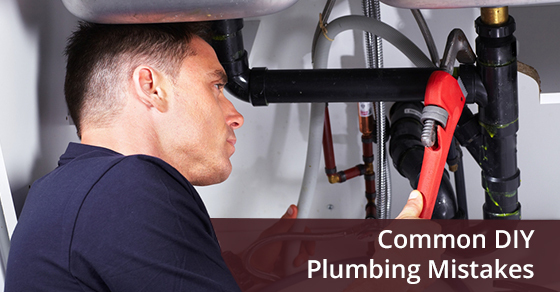 Some plumbing repairs require not only a professional but municipal permits as well. Many homeowners lack proper knowledge of building codes, which is why unlicensed plumbing work can lead to trouble down the line. Municipal permits are in place to keep homes and residents safe. Not abiding by these rules can lead to headaches when it’s time to sell your home or renew your home insurance policy. You could make serious errors when attempting unpermitted changes to your plumbing system and these errors can go undetected for years. So, keep you and your family safe by obtaining the necessary permits, or hiring a qualified plumber for more complex repairs. For more information on your home’s plumbing, or for help with any plumbing issues, give Brother’s Plumbing a call at +1 888-762-3401 or contact us here.